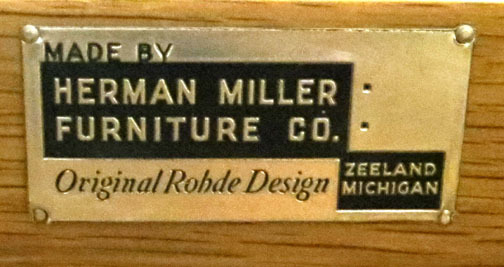 One number 3622 buffet from the Formal Dining Group designed in 1936 by Gilbert Rohde (1894 – 1944) for the Herman Miller Furniture Company, Zeeland, Michigan. Constructed in walnut with birch legs and metal pulls the buffet is 33” high, 66” wide and 18” deep. With the original label inside the top drawer.